Nickname(s): Piccola Roma "Little Roum"
Asmara (Arabic: أسمرة‎, Tigrinya: ኣስመራ, Asmera), lang syne kent as Asmera, meanin "They (feminine plural) makkit them unite" in Tigrinya) is the caipital an lairgest ceety in Eritrea, hame tae a population o aroond 579,000 fowk. 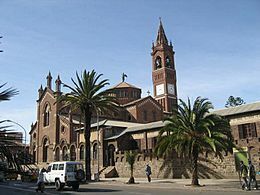 At an elevation o 2,325 metres (7,628 ft), Asmara is on the edge o an escarpment that is baith the northwastren edge o the Great Rift Valley an o the Eritrean hielands. Textiles an clothin, processed meat, beer, shoes, an ceramics are the major industrial products. Asmara wis born oot o a union o fower villages that teuk place durin the twalt century. Oreeginally, it is said, thare wur fower clans livin in the Asmara aurie on the Kebessa Plateau: Gheza Gurtom, Gheza Shelele, Gheza Serenser an Gheza Asmae. Encouraged bi thair weemen, the men unitit the fower clans an defeatit the bandits who preyed on the aurie. Efter the victory, a new name wis gien tae the place, Arbaete Asmera which literally means, in the Tigrinya leic, "they (females) unitit fower". Eventually Arbaete wis dropped an it became cawed bi the italianized version o the wird — Asmara — tho thare is still a zone cawed Arbaete Asmera. The wastrenized version o the name is uised bi a majority o non-Eritreans, while the multilingual indwallers o Eritrea an neighborin fowks remain loyal tae the oreeginal pronunciation. Cinema Impero, biggit in 1937 "Italian Art Deco"
The missionary Remedius Prutky passed throu Asmara in 1751, an describit in his memoirs that a kirk biggit thare bi Jesuit priests 130 years afore wis still intact. Asmara, which wis pairt o the independent kinrick o Medri Bahri, wad briefly come unner the occupation o the Breetish backed an supported Yohannes IV o what wad nou be cawed Ethiopie. Unner his brief an brutal occupation, he gae his trustit Ras Alula the title o governor o Medri Bahri, tae which the fowk resistit. The leaders o Asmara despised his occupation an focht in a hauf a decade lang protractit guerrilla warfare tae free themselves frae his brief occupation, tae which thay eventually became successfu. But the war caused a lot o sufferin an Asmara wis amaist desertit. Asmara acquired importance whan it wis occupied bi Italy in 1889 an became the naitional caipital in 1897. In the early 20t century, a railwey line wis biggit tae the coast, passin throu the toun o Ghinda, unner the direction o Carlo Cavanna. In baith 1913 an 1915 the ceety suffered ae slicht damage in lairge earthquakes. In the late 1930s the Italians chynged the face o the toun, wi a new structur an new buildings: Asmara wis cawed Piccola Roma (Little Roum). While Eritrea wis unner Italian colonial rule, architecturally conservative early-20t-century Europeans uised Asmara "tae experiment wi radical new designs." Nouadays the major pairt o buildings are o Italian oreegin, an shops still hae Italian names (e.g., Bar Vittoria, Pasticceria moderna, Casa del formaggio, an Ferramenta). Asmara wis populatit bi a numerous Italian community an consequently the ceety acquired an Italian airchitectural leuk. The ceety o Asmara haed a population o 98,000, o which 53,000 wur Italian Eritreans accordin tae the Italian census o 1939. This fact made Asmara the main "Italian toun" o the Italian empire in Africae. In aw Eritrea the Italians wur 75,000 in that year. Mony industrial investments wur made bi Italy in Asmara, but the beginnin o Warld War II stopped the blossomin industrialization o the aurie. Italy wis defeatit in 1941, an the Breetish administered the ceety frae 1941 tae 1952. In 1952, the Unitit Naitions resolved tae federate the umwhile colony unner Ethiopian rule. In 1961, emperor Haile Selassie I endit the "federal" arrangement an declared the territory tae be the 14t province o the Ethiopian Empire. Durin the Eritrean war for unthirldom frae Ethiopie, Asmara's airport became a key in the conflict, as it wis uised bi the Ethiopians tae obtain airms an supplies frae ootside supporters. The last toun tae faw tae the Eritrean Fowkliberation Front in the Eritrean War o Independence, it wis besieged in 1990 an wis surrendered bi Military o Ethiopie troops athoot a fecht on Mey 24, 1991. The ceety wis hame tae the US Airmy's Kagnew Station installation frae 1943 till 1977. In Asmara the main leid is Tigrinya. Inglis, Arabic, an Italian are widely spoken an unnerstood. ↑ "CIA - The World Factbook". Retrieved 8 July 2011. ↑ 2.0 2.1 Encyclopedia of Urban Cultures. Grolier Publishing Co., 2002. ↑ J.H. Arrowsmith-Brown, translator and editor, Prutky's Travels to Ethiopia and Other Countries (London: Hakluyt Society, 1991), p. 78. Wikimedia Commons haes media relatit tae Asmara.